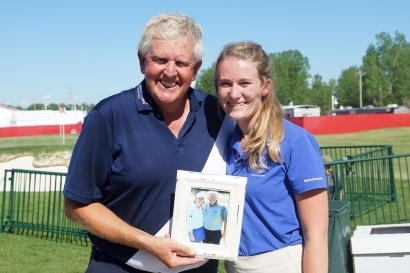 Cailey Rooker reunites with Colin Montgomerie at Harbor Shores, presenting him with photo from their time as teammates at The PURE Insurance Championship at Pebble Beach Golf Links. St. Joseph's Mason Dirlam got to reunite with his pro, Paul Goydas. The duo made it to the final round of the PURE Insurance Championship at Pebble Beach Golf Links. 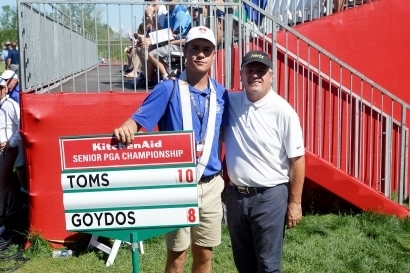 Dirlam was the Standard Bearer for Goydas each day of the Sr. PGA at Harbor Shores. Director of Golf at Clearbrook CC, Eric Campbell, brought his son Ethan from Grand Have to experience some of golfing’ greats. Kirk Vandovern volunteered as a hole martial on #12. He drove down from Grand Rapids. My dad first taught me the art at the 1968 U.S. Open at Oak Hill CC in Rochester, NY, next year’s site for the Senior PGA. I had almost everyone autograph, Jack Nicklaus, Arnold Palmer, Hale Irwin, Bert Yancy, Billy Casper and 56 year-old Sam Snead, We’d check them off in the yearbook and make plans for the next day. There was one person I missed and he was staying at a friend’s house on the east side, Lee Trevino. I taught my son, and even helped when he chased Bernhard Langer down for four holes without success. 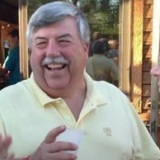 Jim Gallagher Sr. was a good friend from my days in Marion, IN. Langer was his son’s partner that day. “Give me that ball” the elder said. Next I knew Jimmy was on the ropes, took the ball to Langer in the fairway and got it signed. Two years ago Brad Faxson raced two youngsters up to the ninth tee, promising them a glove if they beat him. Down the hill come the youngsters with wide smiles and two autographed gloves. Imagine being the young fan who wound up with Jeff Sluman’s putter. Not playing well in the Regents, Sluman tossed his putter and replaced it for the Sr. PGA. What a souvenir. This year, because of personal illness, I had to turn to my close friend Randy Willis, owner of Harbor Photography, to get the story. Armed with a reporter’s notebook, a dozen golf balls, phone numbers and quick lesson from News Writing 101 (with sample questions), Randy headed to the course. “As I watched the fans receive autographs I was struck by the graciousness of the pros to sign autographs and engage in small talk with the fans. There were a couple who were jerks but I won’t call them out, “explained Willis. “When I approached fans having received autographs they were happy to tell me their stories when they found I had a picture and they might be in the newspaper. I had to apologize as I stumbled with camera gear, note pad and pen trying to record our conversation. I usually shared my story of trying to do double duty. They were gracious and understanding. It was a fun experience getting to hear the different stories. Eric Campbell, director of golf at Clearbrook CC brought his son, Ethan to the course during Tuesday’s practice round. He already had gotten David Toms, Peter Jacobson and V.J. Singh to sign his flag. Toms finished 10th in the tournament. “I wanted to teach him some of the history of past players,” explained Campbell. Kirk Vanovern is a seventh grade science teacher from Grand Rapids. Picking up Larry Mize’s autograph Vanovern said he enjoys interacting with the players. This is his third year volunteering. Randy will share his experiences and photos out on the course plus a visit inside one of Golf Channel’s towers in a future issue. I think he’s graduated to News Writing 102. Many of my regular readers have questioned me about my whereabouts. Please send prayers my way as I’m fighting Pancreatic Cancer. Hope to be writing again soon.